I hate the residue that duct tape leaves behind. I dislike it intensely. Grr. There do exist duct tape equivalents that don’t feature any goopy residue leavings, I just don’t know what they’re called. Though, my need for non-residue tape isn’t really all that great and, in fact, I’ve just now decided that I don’t care enough about this subject to finish my thought! This entry was posted on Monday, July 8th, 2013 at 12:00 am and is filed under Comics. You can follow any responses to this entry through the RSS 2.0 feed. Both comments and pings are currently closed. I was goin for a salesman guy but oh man you’re totally right! 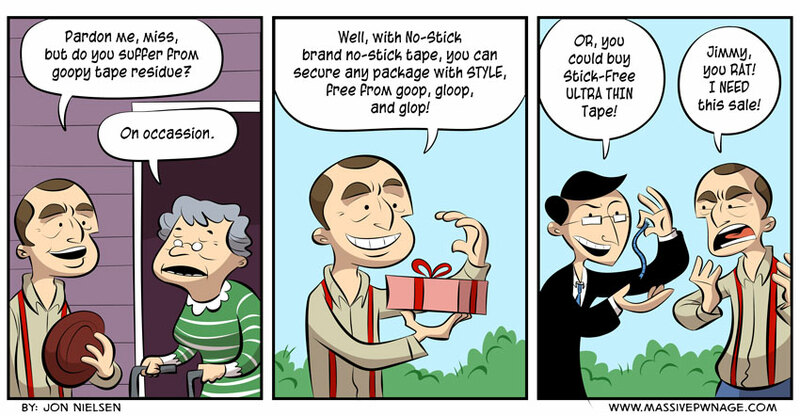 I just found this picture, and it completely reminded me of this strip! That’s the one. I had it once and loved it and could never find it again.